This picture will stir memories for any one who was a student at Clayton School in 1958. Students in the front row have been identified as (left to right) Allan Bellamy, Brian Bolger, Bob Drynan, Stuart McIntosh and Carl Drynan. The second row students were Debbie Rintoul, Shirley LeClaire, Elaine Rath, Dorothy Drynan and Adelle Stewart. In the third row were Mary Stewart, Linda Fligg, Roger Rintoul, Bill Rintoul, Linda Drynan and Mary Rath. 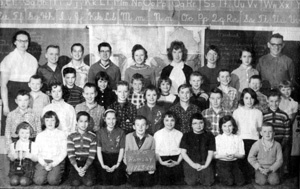 The back row students were Evelyn McIntosh, Morley Wark, Walter Wark, Mrs. Emily Moulton, Donnie Ladouceur, Charlie Rath and Phyllis Barr. 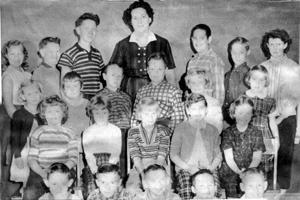 The Photo, dated Sept. 22, 1958, was submitted by Clayton area resident Valma Bolger, student Brian Bolger's mother. 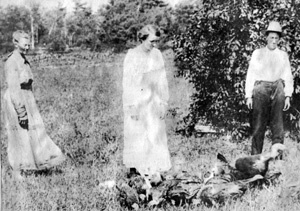 One of the more unusual Pics of the Past we've had in some time, this photo shows Mary, Mina and Harry Richards of Ramsay Township with a flock of turkeys. They used to drive them to a neighbouring pasture for food. This photograph comes from the Tweedsmuir History, courtesy of the Ramsay Women's Institute. Our thanks to the institute for its use. A sure sign of Spring! Mr. and Mrs. Morris Turner out for a buggy ride in the warm sunshine behind their spirited team of horses. Mr. Turner said this was the first time the animals had been hitched up this year and they behaved very well. The Turners drove into Almonte last Tuesday from Union Hall. The photograph from the early 1950's captured The Barr Clan in the family's Tatlock homestead which was destroyed by fire Jan 1. 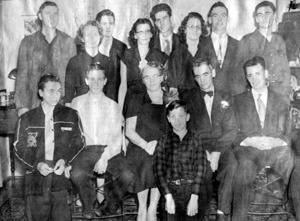 Family members in the front row were, (left to right), Glen, Dan, Donnie, Jean, Mack and Leonard. The back row consisted of Dewey, Lulu (Craig), Harris, Dorothy (Wallace), Graydon, Ruth (Houston), Ronald and Jack. Peter and Craig were missing from the shot which Gail Barr submitted. Do you remember what you looked like in the winter of 1964? Evelyn Miller's class from the Blakeney School can recall with the help of this picture. Check out (front row), Darlene Mitchell, Frances Mills, Harold McPhail, Myfanwy Pratt, Cameron Biard, Elaine Giles, Jayne Munro, Diane Greene, Tim Callaghan, (second row) Keith Currie, Norah Mills, Tom MacPherson, Ray Arthur, Gail Currie, Jim Pratt, Ken Currie, Susan Callaghan, Ross McPhail (third row) Dennis Greene, Frank McPhail, Rosalie Pratt, Jerry McKay, Shelley McPhail, Allan Mitchell, Garth Greene, Percy Greene, Ruth Arthur. (back row) Gary Giles, Ken McPhail, Larry Baird, Sharon Currie, Donna Mitchell, Joan Munro, Wendy Callaghan and Carl Munro. Helen Giles submitted the photo. 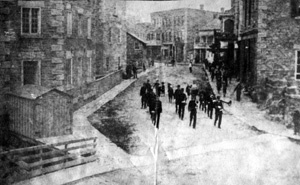 Looking west down Mill Street, Almonte, at the turn of the century. 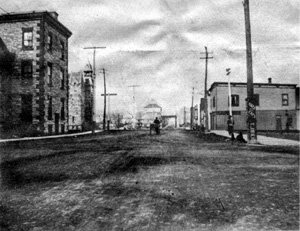 A "canyon" is what one local long-time resident referred to Mill Street as around the turn of the century, and this photograph illustrates why that nickname was appropriate. 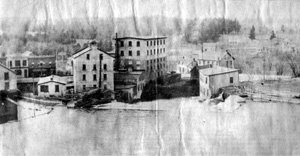 Taken from the bottom of Mill Street looking south east, it clearly illustrates the prominence the mills had on the main street. 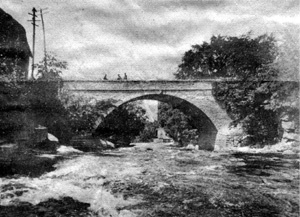 Note the log chute in the far lower left corner, which passed beneath the Almonte Street bridge. It is presumed that the marching band was the local citizen's band. Our thanks to Jim Lowry of RR 3 for use of this photo. 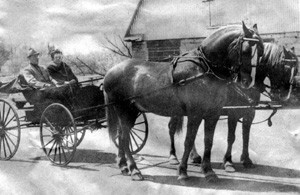 This photograph appearing on a postcard in the souvenir collection originally published by the Photogelatine Engraving Company Ltd. of Ottawa, takes readers back to horse and buggy days on Mill Street, Almonte. This scene was captured from Bridge Street. The date of the original photo doesn't appear on the reproduction. The postcard collection is identified as an Almonte-Ramsay LACAC project from Kenneth Johnson collection. The Gazette is in desperate need of pictures for this space which are at least 30 years old. Share your pics of the past by dropping them into the office. The Auld Kirk, built c 1835, "The Ramsay Church". 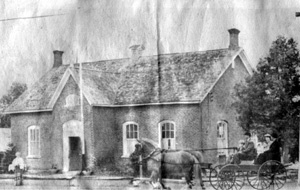 Early Photo of the Almonte Town Hall. Bridge Street from the corner of Mill Street, Almonte. 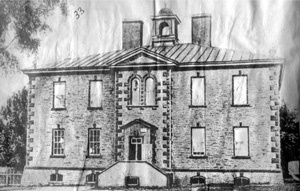 Rosamond Memorial Hospital, Almonte, Ontario - 1909. 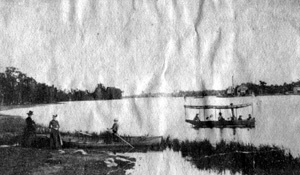 Mayor "John" Drynan's Steamer, Almonte, Ontario - 1890. 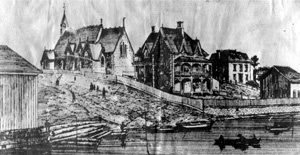 This sketch of St. Paul's Anglican Church and parsonage appeared in the "Canadian Illustrated News" from Montreal Jan 4, 1879, immediately after the parsonage was built in 1878. 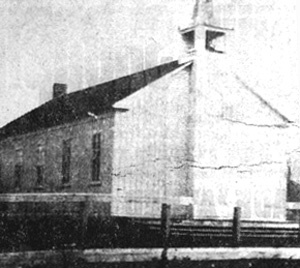 St. Paul's church was constructed in 1863 and celebrates its 125th anniversary this year. An anniversary fair is slated for this weekend. This peek at the past was provided by Gerry Wheatley. This photograph, taken looking west down the Mississippi River in Almonte, was popular with readers in late August. This week the photo re-appears with additional identifying information provided by Jim Byrne, a lifelong Almonte resident, and Howard Ritchie, a former Almonter now living in Stratford. 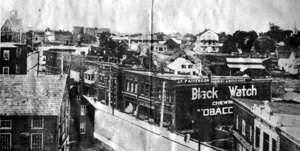 The structures to the left are labeled, (left to right), a former woolen mill and which later became garages run by Mel McEwen and Charlie Black; Holly Cole's Department Store (just a triangle of this business appears); the Sterling Bank; W E Scott's Furniture and Undertaking; M R McFarlane's Drug Store; Dunlop's Bath (shorter building in front of McFarlane's); Rosamond's number 2 mill and West's Store. The centre structure is labeled the "shoddy" mill (the existing "Pinecraft" building) with the Cameronian (Reformed Presbyterian) Church spire rising up from behind it. Atenement house is the shorter structure to the right of the shoddy mill. 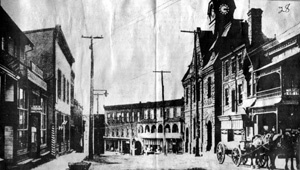 Almonte's first theatre, which was later used for storage, is to the immediate right of the tenement. The Blakely homestead appears behind this cluster. The dark squat building sitting closer to the river in front of these structures is Otto Shane's Shoe Repair. It sits behind the power house. Ramsay Township's Norman Paul submitted the photo which amateur photographer Robert White of Ottawa snapped. Mr. Byrne placed the scene in the period from 1922 to 1924. 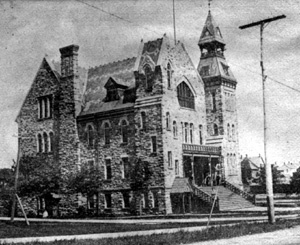 This picture of Almonte High School was taken around 1905. The school built on the present site in 1875 once had separate entrances for male and female students. The bell tower and roof were unique features of the structure. This peek at the past was provided by Ramsay resident Jim Lowry. 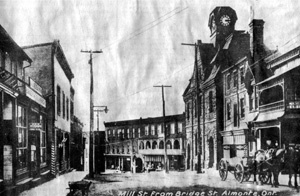 The above photo and that on the opposite page, courtesy of Mrs. D. H. Lowry, show views of lower Mill Street, Almonte, in the earl 1900's. The above photo was taken about 1915 while the one at left was taken about 1900. The discerning eye will note the vast differences in the buildings on the south side of Mill Street in the two pictures indicating that the large three-storey structure in the earlier photo was torn down and replaced in the intervening years. These and other early photos along with antiques and the Tweedsmuir History Book will be on display at "Tweedsmuir History Night", Friday at Naismith Memorial Public School. 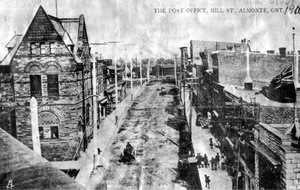 The Post Office, Mill Street, Almonte, Ontario - 1900. Mill Street from Bridge Street, Almonte, Ontario. 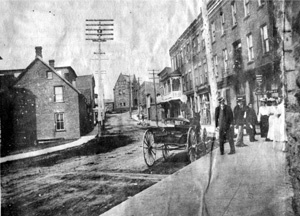 Lower Mill Street, Almonte, Ontario - about 1900. 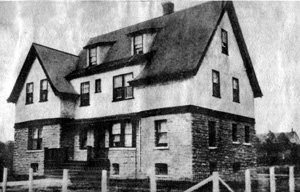 The North Lanark Historical Society Regional Museum as it appeared before last Thursday's fire (1979) that destroyed the former Appleton School and much of its contents. This photo was taken June 23rd at the 10th anniversary of the opening of the museum. Mr. Morris Turner is shown arriving with a load of dignitaries, drawn by his democrat and team of chestnut geldings. This parade looks a little warmer than the one this town saw on Nov. 30. 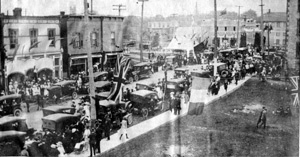 In approximately 1916 this procession took to Bridge Street, Almonte, to celebrate a weeklong old boy's reunion. Edna Allman, then just a young girl, said her family traveled from Arnprior for the event. 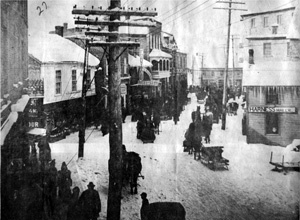 The photo, taken from the Town Hall, shows the businesses along that strip at the time: the Broken Shire Jewellery Store, a meat market and drug and grocery stores. The church in the photo was Grace Church, Clayton, Ont. We understand it was originally an Orange Hall, that had got damaged by fire. The Anglicans bought it and restored it, built a belfry and added a bell. The picture was taken in 1900. It was then sold to Mr. George McMunn who used the material to build a house in Lanark Township near Hall's Mills. The present church, known as St. George's Church was built in 1901. Mr. Robert Watchorn (grandfather of the writer) who was born a few miles south of the village, near Clayton Lake, which was then know as Lake Harmony, led the singing in the choir of the Grace Church for many years, and in addition to farming and church duties, he also conducted a number of singing schools in the district. 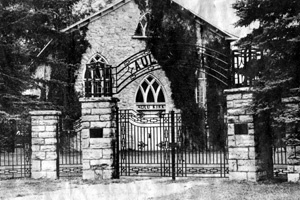 The one in Clayton village was held in 1874. There were no organs in the schools, so a tuning fork was used to start off the singing. One of Mr. Watchorn's pupils a young fellow by the name of Johnny Murphy composed the following verses re the singing school, some ninety-nine years ago. As pleasantly they wend their way towards - Lake Sweet Harmony. by E. Munro - Almonte.